Find the maximum volume of a box made from a 25 by 25 square sheet of cardboard by removing a small square from each corner and folding up the sides to form a lidless box. It is given that we have an 25 inch by 25 inch piece of cardboard. Therefore when squares of side length x inches are cut from each corner, the box that results from folding up the flaps has a base that is 25 - 2x inches by 25- 2x inches and it has a height of x inches. Therefore the Volume V is given by V = x(25 - 2x)(25-2x). Clearly, this is a cubic equation with roots at 0 and 12.5 (double root). But we are not interested in the roots in our physical situation with the box. Rather, we want to know when this function reaches a maximum in the interval from 0 to 12.5 (the only interpretable interval for constructing the box). There are many ways to proceed from here. Using calculus is like using an elephant gun to kill a fly. In this question we are asked to do some thinking and to use the AM-GM Inequality. Now to use the AM-GM Inequality in a maximization or minimumization problem, we need the substitution gained by the inequality to yield a constant. 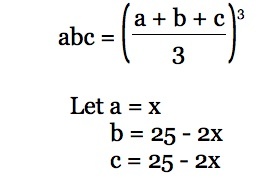 Clearly the sum of 25 - 2x, 25 - 2x, and x still leaves the variable x in the result. But if we re-write x as (1/4)(4x) then we are on to something. x = 25 - 2x. Is this reasonable? Using the formula V = (25 - 2x)(25 - 2x)x, let's make a table of a few values for x and V. For instance, here is such a table clipped from a spreadsheet. It does in fact seem reasonable that the maximum occurs "around" x = 4 and the value of 1157.41 is consistent with the values in our table. In fact the spreadsheet lets us look at other values around 4, such as 3.9 (V = 1153.776), 4.1 (V = 1157.184) or 4.2 (V = 1157.352). A graph (via the spreadsheet) depicts how the volume changes as the size of x varies from 1 to 11.1. The problem here was to construct a box of maximum area from a square sheet of cardboard 25 units on a side. Generalizing to an n by n square is relatively straightforward: the maximum is when . The use of the AM-GM mean provided a proof. Exploration with a table and a graph provides some understanding and visualization of the relationship, but a demonstration rather than than a proof. Various graphing strategies/technologies could and projected the curve and zoomed into the region of the maximum. And for those who did not wish to think about it, calculus could have been used -- take the derivative, set to 0 and solve for the point x at which the function reaches a maximum. If the cardboard was a rectangle but not a square -- say n inches by m inches, or for a specific case, 20 inches by 25 inches -- how would the investigation have been changed? Could the AM-GM Inequality have been used? There would be difficulty with the requirement that all three factors must be equal if the constant term is reached. This would not be possible when two of the factors are 20 - 2x and 25 - 2x. It the problem is to find the boxes which have a volume of 800 cubic inches, it is clear from the graph that there are two such boxes.